Steven (Chicagoland, United States) on 11 April 2016 in Documentary & Street and Portfolio. 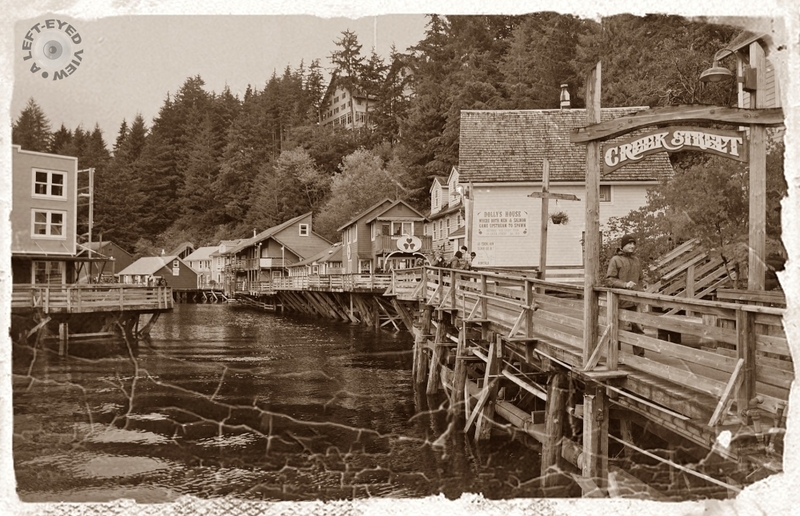 Creek Street is a historic area of Ketchikan, Alaska. The street is actually a boardwalk mounted in stilts on a high slope on the east side of Ketchikan Creek, east of the city's downtown. Creek Street is infamous as being Ketchikan's red light district, roughly between 1903 and 1954, and some of its attractions are commemorations of this past. Its origins lie in a 1903 city ordinance banishing brothels from the city center to the "Indian Town" area on the east side of the creek, and it operated until the brothels were outlawed and shut down in 1954. Numerous houses of prostitution sprang up on this difficult terrain, supported by wooden stilts. Famous among them is The Star, which was one of the largest of these businesses, and Dolly's House, which is now a museum. Winding into the hills above Creek Street is Married Man's Way, a trail used by patrons of the brothels to escape raids. Creek Street was listed on the National Register of Historic Places in 2014. That's quite a history to go with the look ! brilliant processing that takes us right back to the days of the goldrush! Wonderful composition and vintage treatment. Interesting history you describe as well. Well procesed ! I like this result. I adore the way you presented this! I like the timeless feel you offer here, Steven ! Excellent image and a good story ... I like editing ...! An old story of life. Hello, excellent sépia, i like it! with beautiful composition, perspective, tone, textures & reflections! Sounds like a place with a fine history. I like the vintage treatment a lot. A fabulous image! I love the treatment! What a great place to explore! Quel ponton de bois et vue quel rendu et iamge fantastique captage et image. Very nice processing. It really suits the image. Love the sepia tone here, fits well.